Joachim Trier's THELMA looks on the face of it to be a relative of Stephen King's Carrie with a college aged young woman dealing with some sort of psychic power. However while that is superficially true Trier has other things up his sleeve. The plot of the film has college student Thelma living alone and studying. She has had a very religious upbringing and an almost two close relationship with her parents, particularly her father. When Thelma looks at a young woman who sits next to her in the library she has some sort of seizure which no one notices coincides with some weird bird activity. As Thelma navigates her being out i the world including her sexualit, weird things begin to happen. 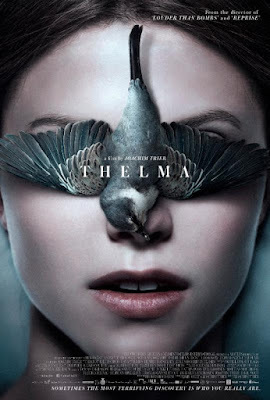 While it could be called a horror film THELMA is much more interested in other subjects such as religious belief, parental relationships and most importantly our path into true adulthood. While operating in a more or less realistic manner the film is churning underneath with all sorts of discussions of the paths we must take to become ourselves. In a strange way the film is an examination of the teaching "if you meet Buddha on the road kill him" since this is nothing else other than Thelma's path to adulthood and is a giant allegory of the trials and tribulations of getting there. Intellectually I like the film a great deal. It is quite possibly one of the best films to be playing at NYFF this year. The trouble or me is that emotionally it's all over thee place. set up like a horror film it also ping pongs around and when it ends it feels more like a character study. While there is tension and some strange goings on, ultimately the film is about Thelma and her growth as a person. When you get to the far side of the the film I was intellectually delighted but emotionally I was left feeling "is that all?" Its the sort of feeling that may change upon a second viewing- now that I know how all the pieces fall tgether, but for right now I'm kind of disappointed. Disappointed or no Trier has some heady stuff crashing around his film and I heartily recommend it for that when the film plays at the New York Film Festival.